An analyst looking to hit the headlines has succeeded with his prediction that Apple is looking to launch a cloud-based television service as part of an 'assault on the living room'. Citing precedent (the major impact the company had on the music industry), a potential new data centre and Steve Jobs' supposedly imminent retirement as key evidence, Peter Misek has penned a note to investors to that effect. "We would find it easy to believe that Steve Jobs' final hurrah before turning the reins over would be to revolutionise video much in the same way Apple has transformed the mobile, computing, and music world," wrote Misek. 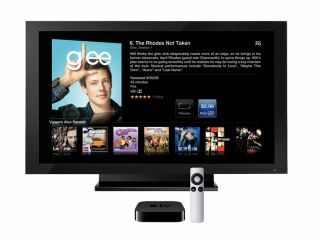 This revolution, he suggests, would come through cloud-hosted video content sold under subscription by Apple, which could have serious implications for the television industry as far as traditional advertising and sales are concerned. Apple recently introduced the subscription model for iPad and iPhone based media publications, with a mandatory 30 per cent cut for the fruity manufacturer. Misek pondered, "Aside from incorporating Apple TV-type functionality, what else could Apple include in the iTV? "We believe a full browsing experience potentially incorporating an iPad, iPod Touch, or iPhone as remote control or input device is very possible. "We think Apple could provide an extremely elegant solution effectively allowing the user to move content between the multiple screens." This use of existing Apple products in conjunction with the new TV product would produce a 'halo effect' on existing Apple hardware, boosting company profits as a result of the cloud TV and iTV launches. But does the analyst have any hard evidence to back up these otherwise meaningless broodings? "We spent the last couple of weeks channel checking with developers and content providers on Apple's possible plans regarding the cloud and their assault on the living room," said Misek. "We find it notable that the content companies, citing a lack of domain license, asked Cablevision to remove channels from its iPad app. "We believe these same companies are negotiating some sort of deal with Apple." So… no, no hard evidence at all. But still, it's an intriguing idea and backs up other rumblings that Apple is looking at the TV side of things with more seriousness than before; another analyst has already tipped that an Apple-made Smart TV is in the works, and Apple itself has fuelled the speculative fire with a relevant job posting.